Left my friends apartment in Bukit Jalil Sunday morning not having any clear plan as to where to go.I wanted to cover as many areas as possible and I have to admit I envied my fellow bloggers for going outside KL and deep into the Malaysian countryside.One even went as far North as Penang. 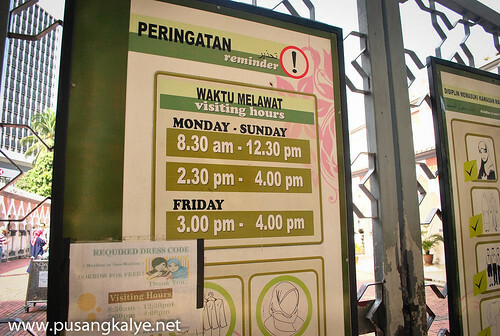 Somehow managed to go South to Penang but that's only 2hours away.So I though of leaving the city again and try Genting Highlands.The problem is,we had to check out of the hotel at 6pm so I was skeptical I might consume a lot of time on the road. 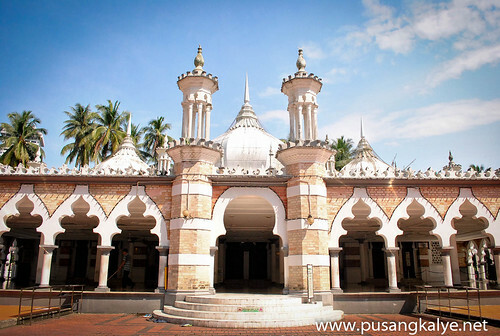 I got my final directions from my friend Mark.And his suggestion to take the train to Jamek Station sure proved very helpful.He mentioned of a mosque located near the station.I was still unsure until I got off the train. I told myself I would go down the station and check what is waiting for me.I was on the stairs of Jamek Station when the view of the mosque caught my attention.It's JAMEK MOSQUE alright. 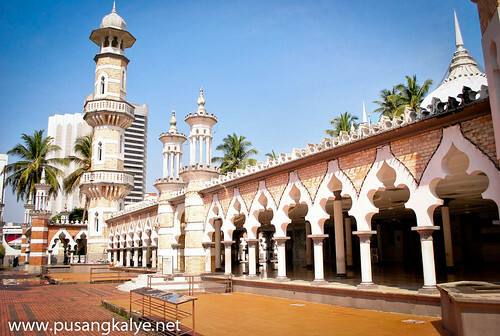 Built in 1909, this is the oldest mosque in the city. 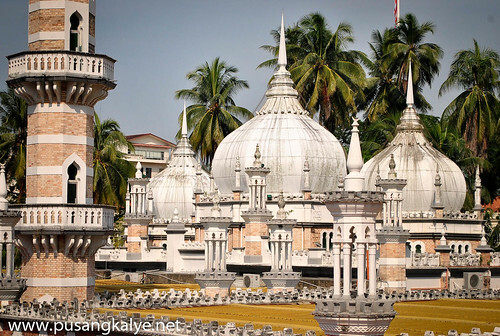 The mosque sits at the meeting point of the Klang and Gombak rivers, which is also the birthplace of Kuala Lumpur.It's architecture is inspired by Mogul influences of northern India, and it was officially declared as the National Mosque in 1965. 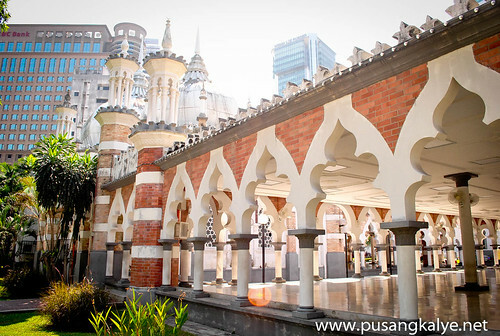 Today, there is a new National Mosque not far away, but this mosque remains important due to its strategic location in the heart of Kuala Lumpur.Its central location to shopping, food and business area makes it a must stop, to experience the unique cultural heritage that Kuala Lumpur has to offer. 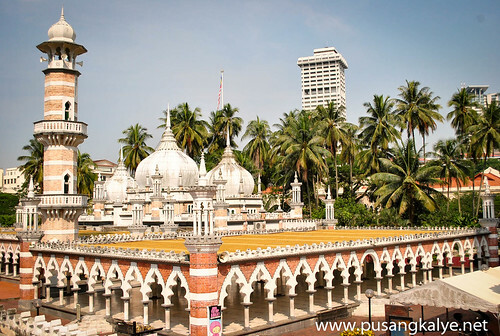 Masjid Jamek is the first brick mosque in the city.It was constructed on the first Malay Burial Ground in Kuala Lumpur.Feature Moghul architecture and heritage,it has three Mogul domes,a courtyard,minarets set at a symmetrical composition of the mosque and smaller chatris surrounding it. Entrance to the mosque is free.I was assisted by a woman in her 40's and told I can go around the temple and take photos if I want but I am not allowed to step on the marble floor where the Muslims pray.I am only allowed to stay along the red bricks around the temple.It is a little small so it takes only a few minutes to go around. 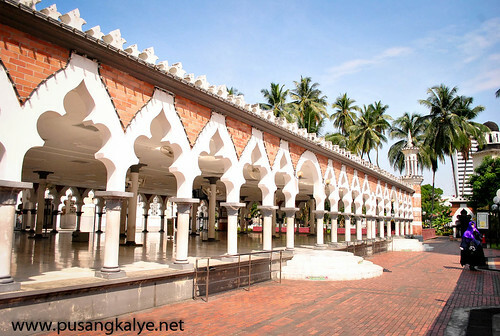 JAMED MOSQUE is just one of among the fifteen (15) Malaysian Mosques open to tourists and is open Monday-Sunday, 8:30-12:30pm and 2:30-4:00pm and on Fridays, 3-4pm. 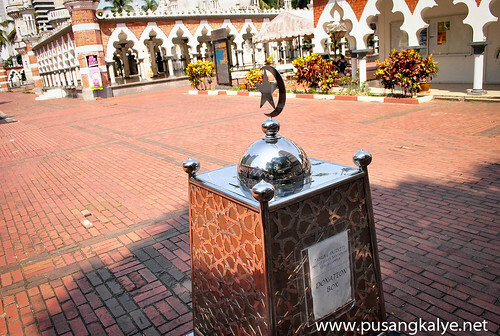 There is also a donation box near the gate should you want to give financial assistance.This is voluntary. Jamek Mosque was the reason why I decided not to go to Genting Highland and explore the city more.If a temple this significant exist in the city,there must be more I thought.And the decision proved to be a good one.Adjacent to Jamed Mosque lies Merdeka Square or the Independence Square of Malaysia where a lot of Historical Treasures are located.I walked to the square and made a discovery after another.I will talk about it in my next post as well as the hop-on,hop-off bus experience. Beautiful! 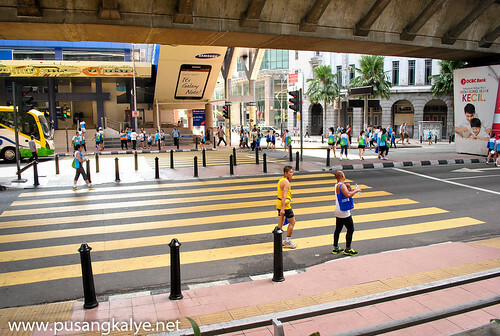 We'll visit KL next year. Nakaka-excite! 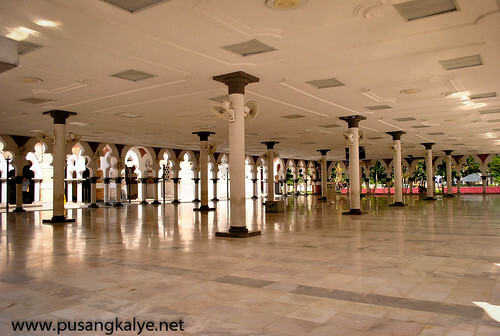 sa mga ganyang temple and religious house, bawal ang nakaslippers or sapatos sa marbles. kelangan nakapaa.